Every now and then you need a meatball fix. And every now and then you just want the comfort of spaghetti and meatballs. 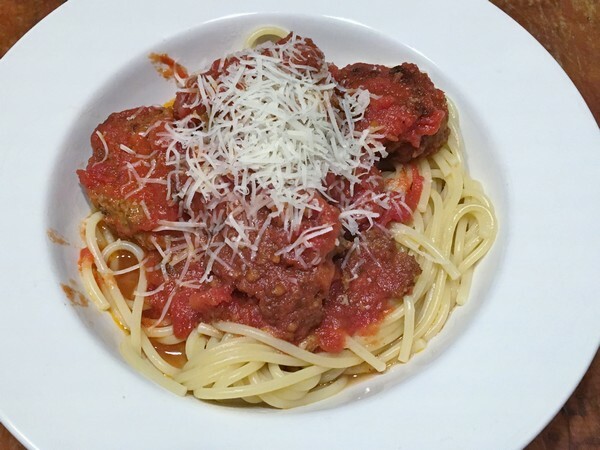 With a winter storm about to hit, it seemed like the perfect time to whip up a batch of my favorite classic meatballs. This recipe on the Food52 site from Rao’s had to be pretty much the standard. It makes about 24 meatballs. Combine beef, veal, and pork in a large bowl. Add the eggs, cheese, parsley, garlic, salt and pepper. Using your hands, blend ingredients together. Blend bread crumbs into meat mixture. Slowly add water, 1 cup at a time, until the mixture is quite moist. Shape into 2 ½” balls. Heat about 1/4” oil in a large sauté pan. When oil is very hot but not smoking, fry meatballs in batches. When the bottom half of the meatball is very brown and slightly crisp, turn and cook top half. Remove from heat and drain on paper towels. 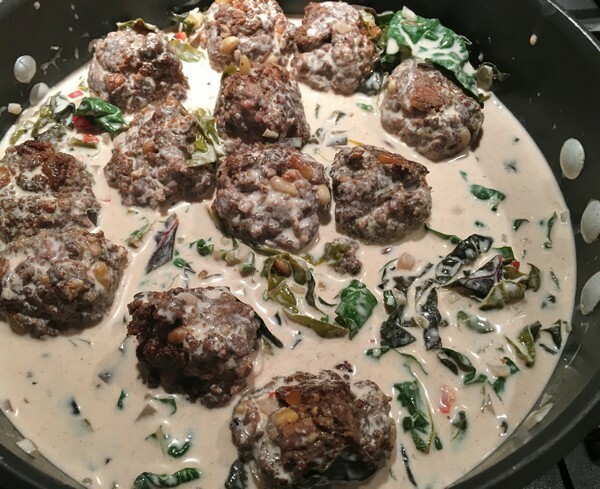 After browning them, if you want to cook them in sauce, use your favorite sauce and add the meatballs into the simmering sauce and cook for 15 minutes. Serve alone or with pasta and enjoy! My verdict: About as good as they get! It’s going to seem weird to be adding water when you’re making them, but it does get absorbed and the meatballs always come out great! The amount of olive oil you’ll need will depend on the size of your pan and be sure not to crowd the meatballs or they’ll never brown. Better off to do them in batches. 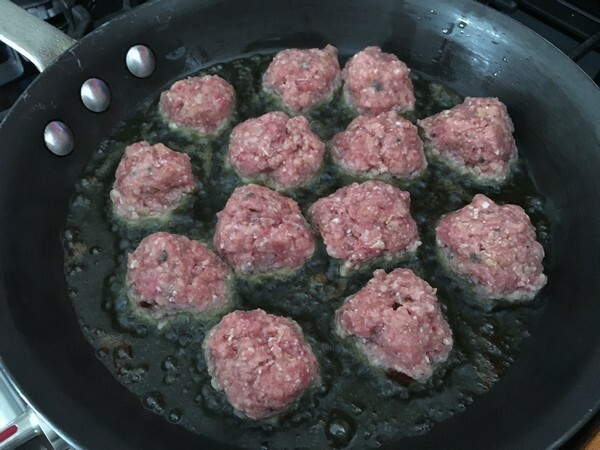 What’s your go-to meatball recipe? Place the first six ingredients in a large bowl with 1 teaspoon of the allspice, 1 clove of garlic, 1 teaspoon of salt and a couple of grinds of pepper. 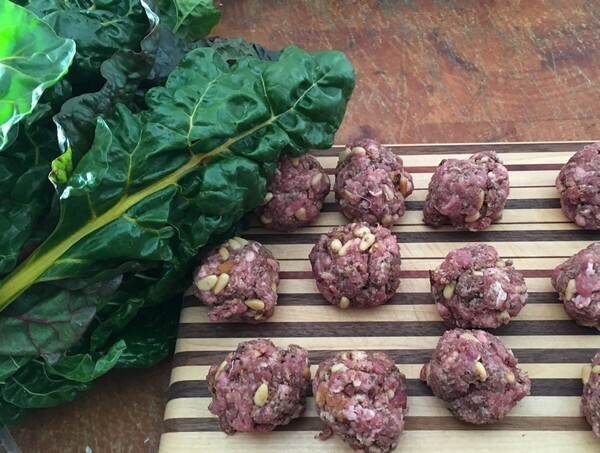 Mix well and form into golf-ball-sized meatballs; you should have about a dozen. Heat 1 tablespoon of the olive oil in a medium saucepan with the onion and the other garlic clove. Cook on medium heat for 8-10 minutes, stirring occasionally, until the onions have softened but not browned. Add the chile and the Swiss chard and cook for 2-3 minutes until the chard has wilted. Stir in the other teaspoon of the allspice, chicken stock and lemon juice. Bring to a boil and remove from the heat. In a large mixing bowl, add the yogurt, cornstarch paste, egg and ¼ cup of water. Whisk well to form a smooth paste. Gradually spoon in the chard mixture, stirring well after each addition until the two mixtures are combined. Add a teaspoon of salt and a couple of grinds of pepper and set aside. Pour the remaining olive oil in a large sauté pan on medium-high heat. Add the meatballs and fry for 4 minutes, turning so all sides get browned. Do this in batches if you need to. Wipe down the pan and pour in the yogurt sauce. Bring to a very gentle simmer on a medium-low heat. It should just barely be bubbling. Stir continuously in one direction to prevent the yogurt sauce from separating. Return the meatballs to the pan, stir to coat and cook on low heat, covered, for 20-25 minutes until the meatballs are cooked through. 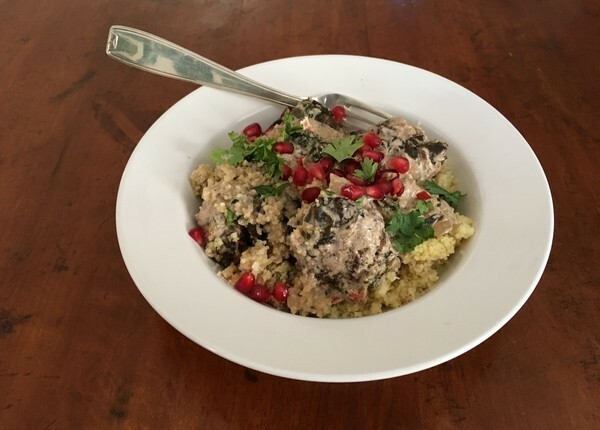 Serve garnished with the pomegranate seeds and the cilantro sprinkled on top and enjoy! 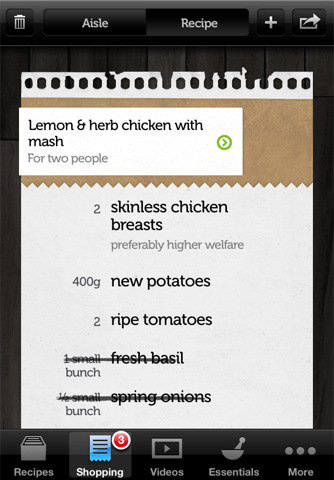 My verdict: Maybe the recipes are “restaurant food” because in a restaurant you have someone to wash the dishes! Without sounding too much like The Twelve Days of Christmas, this used four measuring spoons, three frying pans, two cutting boards, and a mixing bowl washed twice. However, if you can con someone else into washing up, this was a delicious dinner! 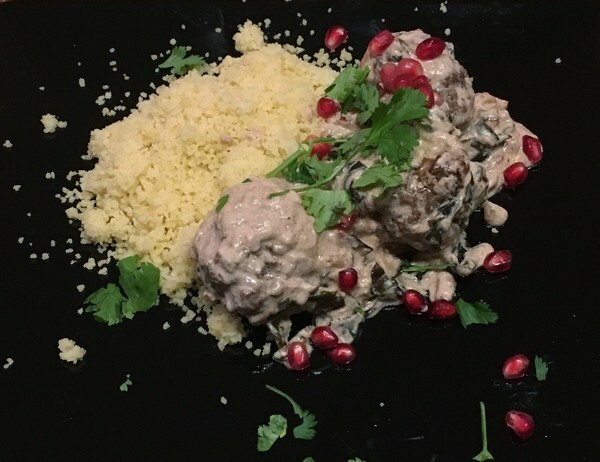 The meatballs were tender and juicy with a nice crunch from the pine nuts. The yogurt sauce was reliable, for once not only not breaking, but adding a rich creamy touch to the lamb. It might have been because I actually used labne instead of yogurt – that’s an experiment I may have to run in the future, and I was very careful to keep the heat low. 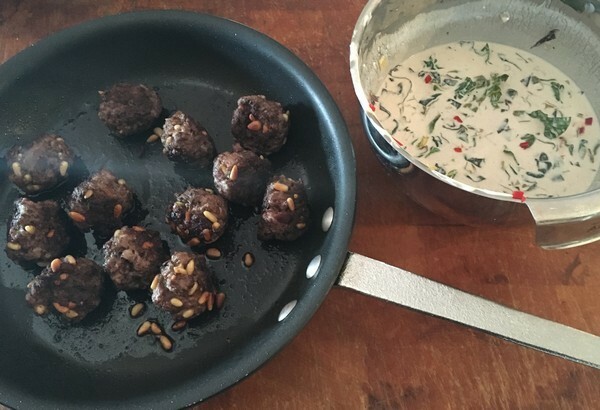 When I made this, I actually made the meatballs ahead of time, refrigerated them, made the sauce later in the day and added the meatballs until they were warmed and cooked through. 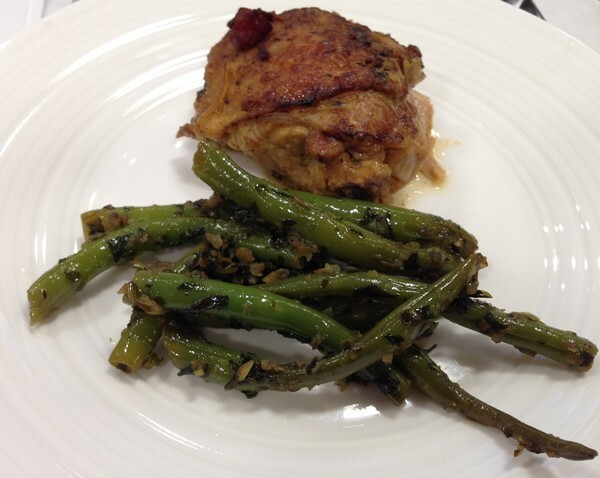 Even though there are a lot of steps (and dishes), nothing is terribly difficult and the results are worth it! Next time, I’ll make the full recipe of meatballs, freeze half and do the sauce as needed. That will save a pan or two. A special shout-out and thank you to Bob & Edesio who hand carried my signed copy of Nopi back from the UK! Come up and I’ll make the Vine Leaf pie! As you know, the Accidental Locavore is a big fan of David Lebovitz’s newish book, My Paris Kitchen. 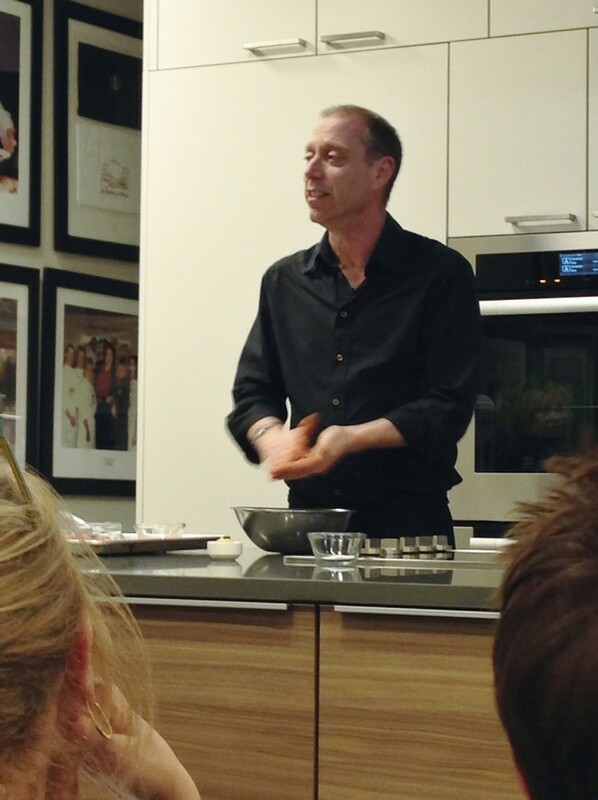 When DeGustibus announced that he was going to be doing a cooking demo, I couldn’t wait to sign up! As it turns out, he rarely does demos since he feels he’s not so good at cooking and instructing (but he would be wrong). We started out with an amuse bouche of tapenade made from black olives and figs and served with champagne to get us in a celebratory mood. The figs were a nice addition to the tapenade, but what David said (and I haven’t tried yet) was that rinsing the capers and squeezing them dry “will change your life.” Stayed tuned! 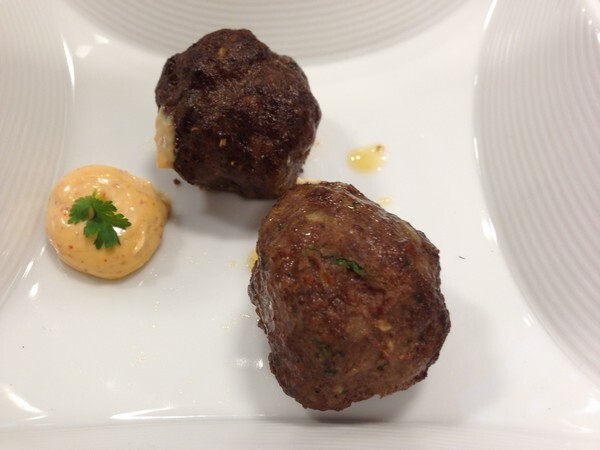 These were followed by merguez meatballs with a harissa mayo. How these escaped me in the book, I have no idea! Nicely browned, the meatballs were just a bit spicy and the mayo added a nice little kick. Definitely have to give these a try and the mayo is a snap to make—just add a tablespoon or so of harissa to about ¾ cup of mayo. Bet it’s great on a lamb burger! Probably my favorite, and definitely the most indulgent, were the Parisian gnocchi with béchamel. 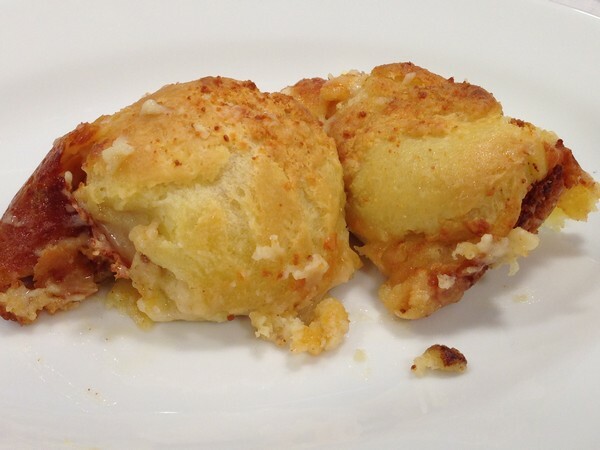 Think savory profiteroles or cream puffs with cheese sauce and you’re most of the way there. It started with a pâté à choux, (it’s what’s used for cream puffs, éclairs etc.) 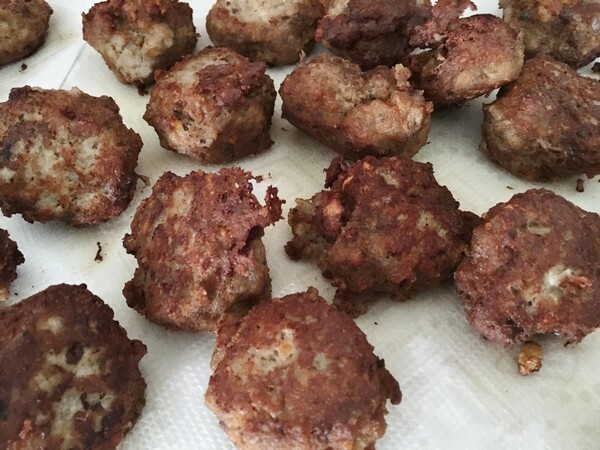 formed into balls and poached until partially cooked. Then David whipped up a Mornay sauce, put the gnocchi in a gratin pan, covered that with sauce and sprinkled a healthy topping of Parmesan and Emmenthal and baked it. Think of it as the French version of mac & cheese, but better, so much better!! Not that we needed anything else, but his main course was the chicken with mustard which I’ve made (and it’s great!). Your choice of mustard really counts here, so splurge and get some real Dijon. And if you think that green beans are generally ho-hum, you haven’t tried his—steamed and drenched in snail butter, in other words, lots of butter and garlic! For dessert, a chocolate, salted-caramel mousse. Since David is known as a pastry chef, it should have been the highlight of the evening, but it wasn’t my favorite thing. 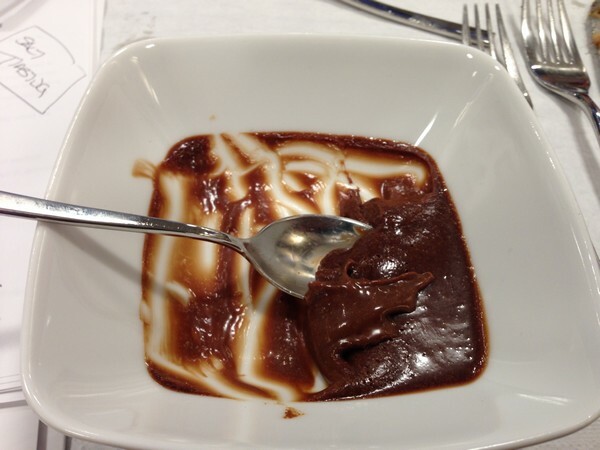 The texture was a little too slick and pudding-like for my taste, since I’ve never been a fan of toothless desserts. If any of these sounds like something you’d like to try, get the book. It’s one of the few that’s crossed my desk that I’ve used over and over.